It is around seven months until we head back to France. While that seems like an eternity (I’m wishing it was seven weeks, or even better, seven days) I am in full on planning mode. While I’ve developed some fairly decent desktop research skills, I still can’t go past recommendations from people who have already frequented the places we are planning to visit. We are really looking forward to exploring Bordeaux on this next trip and I’ve been badgering every traveller I know for hints and tips. The lovely Liz Holtfreter of the gorgeous interior style blog Peonies & Pretty Things is both a colleague and a friend – and she and her husband also happened visit Bordeaux last year on their honeymoon. Liz kindly provided me with a her top five things to do in the Bordeaux region. It was so comprehensive I had to share it on Distant Francophile, just in case anyone else is planning a visit to Bordeaux soon. Tour the Left Bank of the mighty Garonne River for a day, exploring the Médoc area. This sub region is ideal if you love Cabernet Sauvignon, or if you like the idea of capturing images of châteaux that look like something from a fairy tale. It is by far the prettiest wine region I’ve ever seen. The cellar doors generally don’t accept walk-ins, so we booked our tours via the hotel. Our highlight was Château Lynch-Bages where we were lucky to see their current production centre, the wine cellar and even the preserved traditional machines used years ago that have been kept on site. There is also a quaint little village on location at Lynch-Bages, complete with a delicatessen where we purchased some Dijon mustard blended with blue cheese, fresh meats, local produce and a great collection of local wine. There is also and a typical old school pub which served a great charcuterie plate. Spend a day in Saint-Émilion, which is on the Right Bank of the river. Don’t miss the Catacombs – you can book a visit on the day at the tourist bureau. You’ll get to see a monk’s residence from centuries ago and the Catacombs, but the tour highlight for me was walking inside the amazing Monolithic Church. The church was built in the 12th century and literally dug out from within – they used the clay from the inside to construct the bell tower which is still standing.I promise I am not exaggerating when I say there is one wine shop for every eight residents in Saint-Émilion. La Grande Cave De Saint-Emilion is one wine store we visited and we spent a good amount of time tasting and chatting with the staff. You’ll find the store right next to the Tourist Bureau. For lunch we went to a restaurant/cafe opposite the wine store – it had a nice alfresco area out the back (it’s more like you are sitting in someone’s backyard garden). I can’t remember the name of it but I do remember it was green on the outside and the owner of the wine store told us to head over. The view from Saint-Émilion is beautiful, and I loved the cobbled streets. Wear comfy shoes with traction as some of the streets are sloped and easy to slip on! Explore the Right Bank beyond Saint-Émilion; this is something we didn’t do but would have if we’d had more time. The wineries and cellar doors are said to be more family run, compared to the more commercialised stores in the Left Bank. The locals told us that you won’t need a booking to visit their wineries so it would make for a relaxing day. On a side note – the Merlot in the Right Bank is absolutely amazing. We won’t touch straight Australian Merlot unless it’s blended with something else, but the French do wonders with theirs! Discover central Bordeaux. 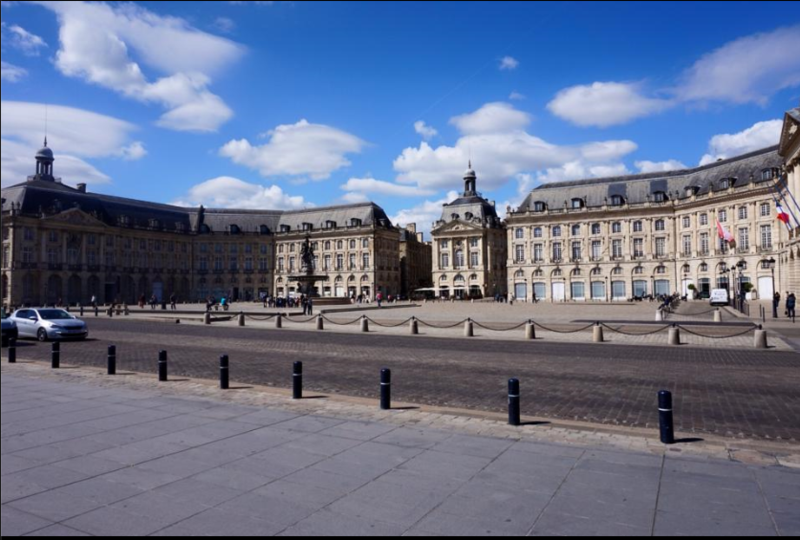 I can’t remember the street names, but you will know you’ve hit central Bordeaux when you find a large flat water feature and the buildings on the opposite side of the road kind of wrap around together. The main road leading up to central Bordeaux is quite long, but we found underground parking near an oyster bar that led us straight there. We didn’t get to walk along the foreshore as there was a market being set up, but it looked like a good walk if you want a relaxing morning. For lunch we visited La Boite à Huitres which happened to be the oyster bar near the carpark and it was another highlight! We made a booking in advance as it tends to get quite busy. It’s right in the centre of Bordeaux, walking distance from the foreshore. The shopping strip is on rue Sainte-Catherine which is a two minute walk from La Boite à Huitres. Enjoy the excellent food. We only stayed in Bordeaux two nights with just one night out for dinner. We went to Le Pavillon des Boulevards and we would definitely go again – silver service, delicious food, a five star rating (sadly not Michelin, but they must be in the running to get a star soon) and a great atmosphere. It was here that we practiced French with the waiters and they taught us how to ask for the bill! A big thank you to Liz for sharing this list and your lovely photo – we are so grateful. Have you visited Bordeaux? Do you have any other tips for fellow travellers? If so, we’d love for you to share them in the comments section below. Photograph courtesy of Liz Holtfreter. Published with permission. Perfect timing, Bordeaux is the second stop on our trip. We will be there for 6 days and I’ve been researching and reading so will be happy to let you know what we find. Oh Claire, I’m so looking forward to following your trip on Instagram. And you definitely need to let us know your favourite things about Bordeaux. We could even do a feature based on the best bits from your trip if you are keen.